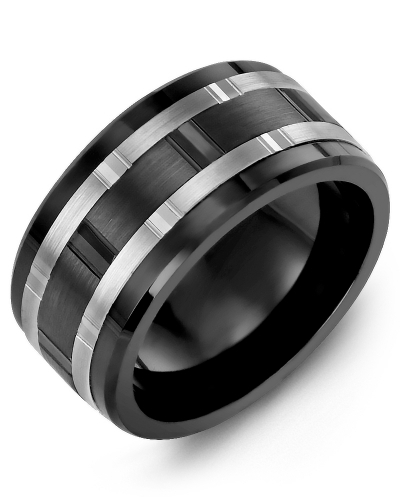 MLK - Wide Black Multi-Faceted Wedding Ring Sleek and sophisticated, this Wide Black Multi-Faceted Wedding Ring is stunning in its simplicity. A classic combination of black and white, it features a two-tone insert set within a ceramic ring, a tungsten ring or a cobalt ring. The insert is available in 10kt, 14kt and 18kt options, and the inside of this designer wedding band can be engraved to create a bespoke piece of jewellery. Timeless and beautiful, it would make a stunning eternity ring too. Sleek and sophisticated, this Wide Black Multi-Faceted Wedding Ring is stunning in its simplicity. A classic combination of black and white, it features a two-tone insert set within a ceramic ring, a tungsten ring or a cobalt ring. The insert is available in 10kt, 14kt and 18kt options, and the inside of this designer wedding band can be engraved to create a bespoke piece of jewellery. Timeless and beautiful, it would make a stunning eternity ring too.